Surgical site infection is a real concern even in sterile hospital settings. Hand hygiene and donning surgical gowns and gloves are ways for surgeons to prevent the transfer of bacteria, but Makati Medical Center, one of the leading hospitals in the Philippines, goes the extra mile by suiting up its surgical team in the Flyte Personal Protection System, the first of its kind to be used in the Philippines. The Flyte Personal Protection System, also known as the Flyte suit, is a state-of-the science suit composed of an impact-resistant helmet and water- and tear-resistant gown. 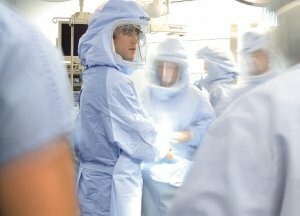 The surgeon and the rest of the surgical team are covered from head to foot during a patient’s surgery, with a suit that provides thorough protection against exposure to infectious body fluids and transfer of infection-causing bacteria. At MakatiMed, the Flyte suit is currently used in major orthopedic cases with high risk of infection, primarily joint replacement surgeries. “Infection prevention, especially in hours-long orthopedic surgeries, is crucial to patient safety,” said Liberato Antonio C. Leagogo, Jr., MD, FPOA, Chairman of the Makati Med Department of Orthopedic Surgery. He added that surgical site infections or SSls are caused by bacteria that enter incisions made during surgery. An SSI may cause redness, inflammation, discharge of abscess, fever, and pain. 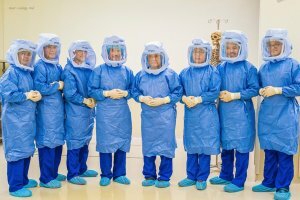 “As a premier hospital, MakatiMed already ensures patients and hospital guests are safe from infection, but the Flyte suit further guarantees that both the medical team and our patients are completely protected in the operating room, safeguarding the patient from delays in his or her healing process,” he said.